Why are oil prices so much higher now than they were prior to the 2000s? Much of the difference has to do with the steady stealth devaluation of the US dollar, reflecting the US government's massive debt and deficit spending practises. Compared to the price of oil in 2010 dollars -- or to the price of oil in gold -- prices prior to the year 2000 were not so much lower as we might think. Two price spikes prior to the year 2000 were comparable to -- or higher than -- our current inflated oil prices. But there is more to the story than the pitiful performance over time of the US dollar. An explosion of demand for oil from emerging nations -- from the late 1990s to the present -- explain a great deal of the ongoing oil price bubble. Particularly when one takes into account government subsidies for oil which hold the cost of oil use artificially low from Mexico to Venezuela to many MENA countries, China, India, and beyond. This explosion in demand was the natural result of exploding populations in those countries combined with an emerging consumption sense within those populations fed by global media and a subsequent growing sense of entitlement. 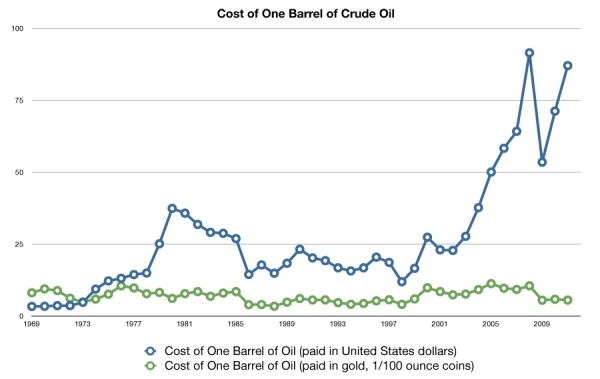 Comparing oil prices in "dollars of the day" vs. oil priced in either standardised 2010 dollar or gold, brings out more aspects of the dynamic than are generally discussed. In addition to the ongoing stealth dollar devaluation and the demand explosion from the emerging world, oil has become a deeply emotional repository of value for many investors -- reflecting a widespread belief in oil scarcity -- or "peak oil". Savvy traders have exploited this superstition by helping to bring about multiple whiplash spikes and troughs of oil price -- which in the aftermath often leave the smart traders richer, and the superstitious true believers that much poorer. Of the three drivers of higher oil prices mentioned above, the most likely candidate for the "largest" contributor, is demographic change. Let's look at why this "largest contributor" may not end up being the most important long term contributor to changes in oil prices. We all know that commodity prices depend upon both supply and demand, as well as a number of somewhat arbitrary and changeable government policies, mandates, regulations, taxes, prohibitions, and other caprices of the generally clueless political class. Demographic change affects both supply and demand, but demand is the more immediate factor affected by the type of population growth we have seen recently. The explosion of both populations and demand in emerging nations shook the ability of national oil companies to respond -- in large part due to a corrupt failure to pay for necessary maintenance and technological upgrades. And since most conventional oil reserves fall under the control of corrupt national oil companies, the demand explosion was not immediately accompanied by an equivalent explosion in supply. This mismatch pushed oil prices upward. But population growth without the ability to pay for more commodities, will not necessarily convert to higher demand, and higher prices. If the regions of population growth cannot pay for more commodities, they will either go without or will be the recipient of unearned aid from wealthier countries. This is what we are beginning to see across Africa, much of Asia, and other parts of the third world and emerging world. As advanced world demand for the products of emerging and third world nations drops, their ability to pay for imported commodities likewise drops. And the prospects for the advanced world economies is looking more and more dim, as the other bubble -- the demographic bubble -- deflates. Between the Baby Boom of 1945-1964 and the “baby bust” that followed it, the result is a projected ballooning in the relative numbers of the elderly. From 12% of the population today, the proportion of those over the age of 65 is forecast to rise to 25% by 2030 — and stay there for decades afterward. Old people do not typically use as much oil and other commodities, they do not build as many houses, or buy as many cars -- as a rule. With the contraction of demand from economies in the advanced world, comes a reduction in ability to pay for both luxuries and necessities -- including commodities -- in the emerging and third worlds. That is not the worst of it. Piling on top of the debt and demographic problems of the sinking nations of the advanced world, is an amazingly destructive dysfunctional energy ideology which threatens to drop many of these nations -- both individually and in groups -- beneath the waves. Intelligent people understand that the intermittent unreliable energy sources such as big wind and big solar, cannot supply more than a small portion of grid power, without destabilising the grid itself. At the same time, a very powerful political lobby is attempting to bluster its way into control of energy policy across the advanced world (PDF). What is this powerful political lobby championing? Yes, they are blustering and slobbering about the intermittent unreliables, big wind and big solar. The PDF link in the paragraph above makes fantastical claims in favour of big wind development for the UK. But the same type of unsupported bald assertions, of malformed and perverse wishful thinking, stands behind the push for the green dysfunction in Germany, the US, Japan, and in several other "at-risk" nations of the advanced world. As the demographic implosion in the advanced world builds, and begins to take casualties across the emerging and third worlds, the many fantasy projections of unlimited and exponential demand that underlie the belief in ever-higher oil prices and ever-declining supplies, will be shattered -- along with the life savings of many true believers. It will certainly be "the end of the world as they know it," but it will not be the collapse of civilisation. Nations of the advanced world -- the ones that thrive -- will discover and develop more sources of energy, and will learn to do more with less at the same time. Improved efficiencies and productivity will contribute to the declining demand for imported commodities which will also be driven by the declining demographic. Increasing use of robotics and other automation will help to raise productivity, even as core populations decline. But energy will always be key. Which is why the energy starvationists -- from Merkel to Obama to Gillard and beyond -- will have to be moved out to make way for a better future. I noticed the dollar price exceeded the oil price not long after Nixon pulled out of Bretton Woods, linking the dollar to gold. HILN: Right. And a lot of people are beginning to treat oil as if it were gold. That is a mistake.